Well, technically, this is Leo’s third bed (and hopefully his last for a while). 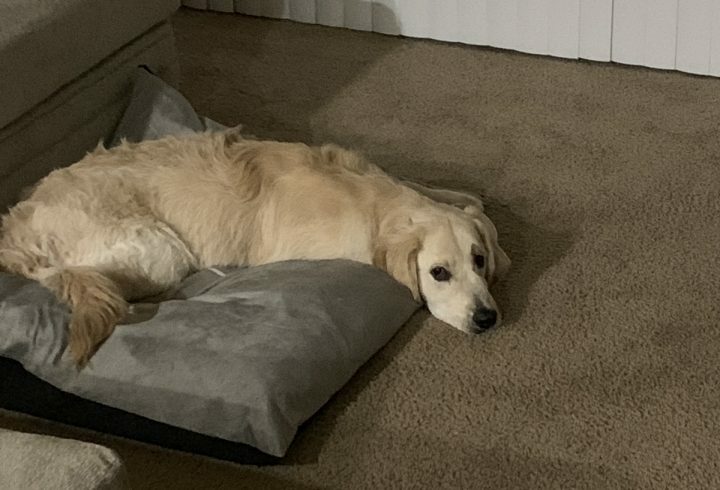 His first bed lasted less than a week, and his second bed lasted less than 10 minutes (talk about a waste of money). We got Leo his first bed when he was about 3 months old. He had a couple accidents on his first bed, which wasn’t a huge deal, but then he chewed right through it. Luckily, we caught him before he could totally destroy it and make a huge mess. There was no fixing it though, so we took the loss and threw it away. 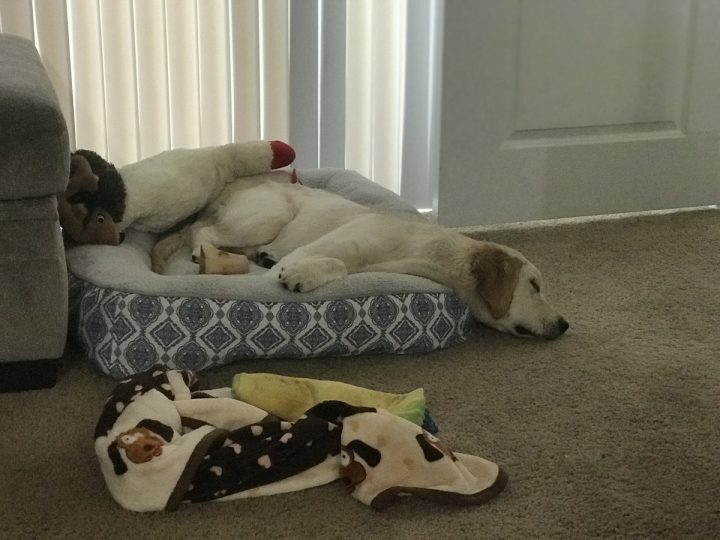 A few months later, when I was sure he wouldn’t pee on it or chew it up, we got him another bed. This bed wasn’t bolstered so I figured it wouldn’t be construed as a chew toy. Sadly, I couldn’t have been more wrong. Leo put a hole in that bed within minutes of us setting it on the ground. Minutes. We tried to salvage it by duct taping the holes so Leo wouldn’t eat the insides, but that didn’t work either. So we had to begrudgingly throw it out. He didn’t pee on it though. So, that’s a plus. After two failed attempts at providing Leo a bed (and essentially lighting money on fire), we swore off beds for a while. But now that we’ve been trusting Leo to be free in the house (he hasn’t been crated at all in about 3 weeks – woo! ), we’ve decided he can be trusted to not destroy a bed. 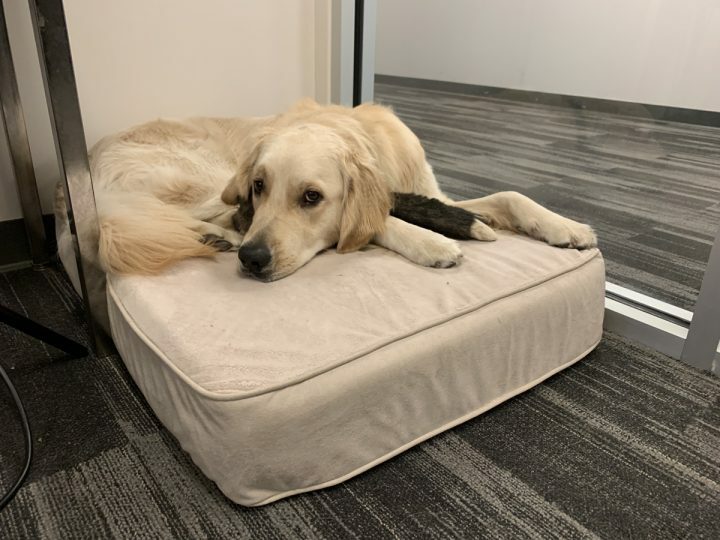 So far, so good while at the office (caught him cuddling with his toy), but we’ll see how he does with a bed at home. Fingers crossed for his comfort and my wallet’s sake! I buy my dog bed/cushions at costco. The very sturdy removable covers are washable (I add bleach, too) & difficult to chew through. In my multi-dog household (6 at one time…lol) they still lasted a long time – the insides gave out way before the covers. & they were washed & bleached weekly. I’m so glad you enjoy Leo’s stories! I love sharing (venting? HA) them with everyone! my 2 younger girls like to paw the bed, especially after a bath, grooming or when they are bored. you could have gotten a cover, or put a pillow case on it. there is a company called Molly beds? that make covers and you can stuff them with anything. it is like a duvet. my girls have an occasional accident but it is not pee! i think they do it when they get mad because i was gone too long. some dogs just like to tear up anything. i go a really nice big, thick, bed at Aldie’s. it is a large bed so both the girls can sleep on it during the day. it was abt 35.00. i brought one similar at petsmart and it was twice a much and this one is really nice.